Join the discussion on our forums! Come discuss Biteweed over in our dedicated Biteweed discussion topic. Why isn't it one mana? Questing Adventurer has the same Tempo rate AND it can grow AFTER it is dropped. Card is not good enough. Too many cards needed for a decent buff. Of course questing is better, but did any of you ever think about running this in addition to questing? I have one copy in my miracle deck for standard, its actually a pretty good card. In fact, its very good alongside questing. 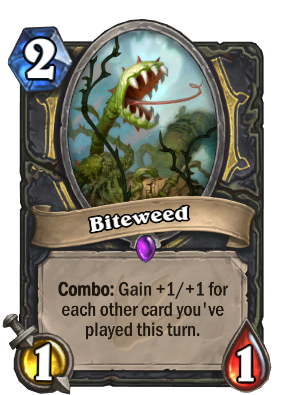 Play questing first, a few cards, and then end with biteweed. You now have two large bodies on the board. Miracle needed more high tempo bodies with how much they lost on rotation. This fits the bill pretty well. Just because it's worse than edwin doesn't make it a bad card. Well, considering you'll have to spend a considerable amount of cards at such an early stage in the game to make this card somewhat good makes it garbage. Edwin's power is growing to a massive, say, 14/14 or 16/16 to kill your opponent in two turns if they have no way to stop him. This little bugger will generally be maybe a 7/7 or an 8/8 if you go all in, which costs you all your cards, and then you'd rather run 2 arcane giants which are also cheap 8/8s but don't actually cost you cards in the lategame. Question does it count itself as a card played to gain 1/1? For instance, if you backstab and play this on turn two, is it a 2/2 or a 3/3? My guess is that it's just a 2/2 because it says "other". If so, this card is weak. Dude have you ever played Edvin before? This is going to lead to many busted early turns. I'm not sure if Questing Adventurer isn't just better though, because he starts bigger and can continue to grow at the same rate but costs (1) more. If nothing else, you can probably slot these in to some of the rotating/Hall of Famed vacancies in a Miracle Rogue and more regularly have a far ahead of curve beater. You gotta love that weed! Audrey 3: "Feed me Valeera!" Your suggestion was used as the flavor text! It should be EdWeed VanLeaf. like Sweddy409 wrote. They both have different mechanics.